You're probably wondering if you're in the right place, seeing as this is a recipe post and I haven't posted one since February. Fear not: this is, in fact, The New Me and I have, in fact, taken the time to cook and photograph something delicious. My very fickle cooking mojo appears to have made a comeback - let's home it sticks around for a while! We make pizza a lot, usually with a tomato sauce and toppings piled high on our own quick and easy homemade pizza crust. No cheese, of course, and we hardly miss it. Homemade pizza is healthier, tastier and cheaper than store bought, plus it's easy to make. 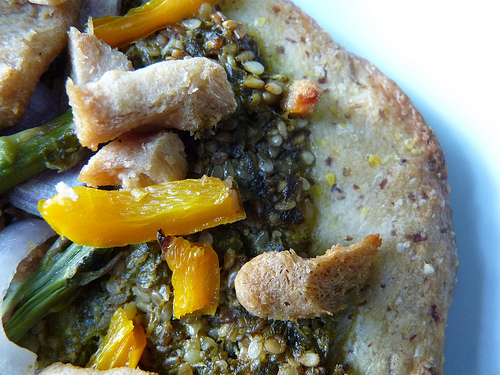 This week, the spring weather inspired a craving for pesto pizza and I was not one to argue. Here's a little secret about pesto: you can use any nut you want! Traditionally it's made with pine nuts, but those can be pricey. I usually use walnuts or almonds. If I'm feeling really crazy, I go for pecans. Unfortunately, I was out of all four of those nuts when it was pesto making time, and as we all know pesto is not pesto without a nut. Thanks to some quick Googling I discovered that all was not lost. I found recipes for pestro recipes that use sesame seeds AND peanut, both of which I had in my house. Because I was making pizza, I decided to go with the sesame seeds. (A peanut pesto seems better suited for a stir fry of some kind, perhaps with a squirt of Braggs and some cilantro. Maybe next week!) 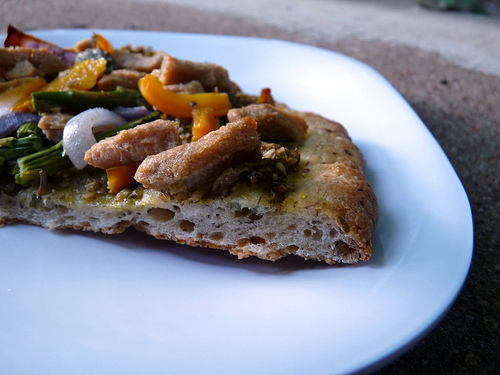 And instead of our Italian inspired pizzas (topped with yellow onion, green pepper, mushrooms and vegan crumbles) I went lighter and brighter - vegan chick'n strips, red onion, yellow pepper and asparagus. Nathan declared it my "best pizza yet." I couldn't help but agree. You'll have to decide for yourself. Toast the sesame seeds in a dry skillet over medium heat until lightly browned and subtley fragrant. Watch pan carefully because sesame seeds burn easily. Set aside to cool. 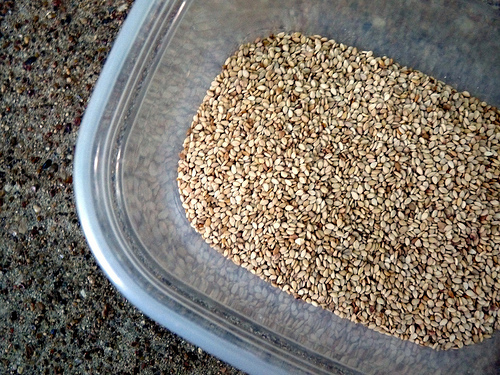 Once cooled, place sesame seeds in a blender or food processor and blend until coarsely ground, about 30 seconds total. Add the basil, garlic, lemon juice, salt and pepper. Blend mixture using the pulse button setting. Use immediately or store in covered container in refrigerator. Use up within 1 month. Bring to room temperature before serving. To make a pizza, simply top your homemade crust with pesto and whatever ingredients your heart desires: bake in the oven for 25 minutes and enjoy!